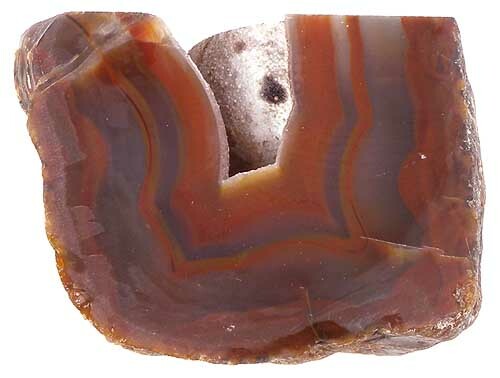 Piranha Agate was mined out over 30 years ago. We bought this material years ago and just "mined" it out of our archives. 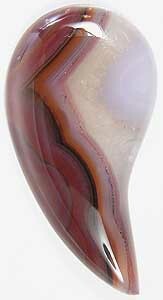 Piranha agate is super solid and has great colors and figuring. There is very little rough on the market but we have a reasonable amount to offer our customers. 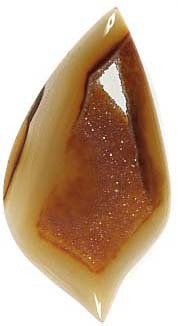 As with all of the other species in the quartz family, agate takes a high polish with cerium oxide, but also takes a fine polish with tin oxide and diamond. Mohs hardness 7. 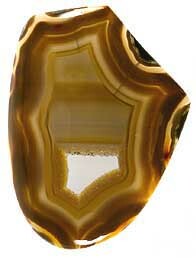 Sample of Piranha Agate Rough (cut on one side to reveal pattern). Measures approximately 7" x 6-3/8" x 4" at the thickest point. Measures approximately 7-1/2" x 6-1/2 to 3-1/2" x 3-3/8" at the thickest point. Measures approximately 7-1/4" x 5-1/2" x 3" at the thickest point. Measures approximately 6" x 3-3/8" x 3-3/8" at the thickest point. Measures approximately 5" x 4-1/4" x 3" at the thickest point. Measures approximately 7" x 6" x 3-3/4" at the thickest point. Solid nodule with nice fortification potential and is an excellent slabber! Measures approximately 5" x 3" x 1/2" at the thickest point. Measures approximately 3-3/4" x 2-1/2" x 2 to 1-1/2" thick. 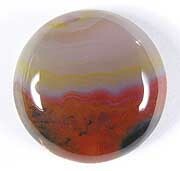 Beautiful transluscence with orange striping!